Description (From Goodreads): Ari can’t help feeling lost and alone. With teal eyes and freakish silver hair that can’t be changed or destroyed, Ari has always stood out. And after growing up in foster care, she longs for some understanding of where she came from and who she is. 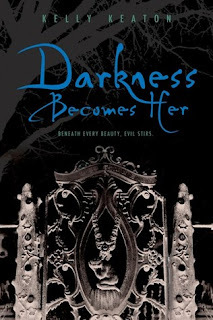 Kelly Keaton’s debut novel, Darkness Becomes Her was such a wonderful surprise. Everything about this exciting story is unbelievably creative and interesting. Personally, I have always loved the old Greek Myths and stories featuring them have always caught my interest. In today’s young adult market many of the paranormal themes are quickly becoming overdone. First it was vampires, then it was werewolves and angels and 2011 seems to be the year of sirens. Greek mythology is a relatively uncharted territory (besides the Percy Jackson series), which allows Keaton to craft a truly unique story. However, she doesn’t just stick with the Greek myths; Darkness Becomes Her is sort of a “melting pot” of paranormal characters. There are so many different types of creatures within this book, you honestly don’t know what you are going to find next. Take for instance, the main character of Ari. Ari has always known she is different and the book begins with her trying to find some answers. She was given up for adoption at the age of four and therefore has no clue about what exactly makes her the way she is. In fact, the reader (as well as Ari) is clueless when it comes to her heritage for the majority of the book. I don’t want to give anything away, but let me say this – Keaton certainly hit a homerun with this one. I was completely thrown off guard with the answer, I never saw it coming. But, I cannot wait to see where the story goes now that Ari knows her true identity. I have a feeling it is going to be awesome. I am especially interested to see how her pending romance with the ultra attractive Sebastian develops from here. Sebastian has rather interesting heritage as well (no, I’m not giving it away! ), and I think that their relationship is going to be rather exciting. It certainly will be unique! Like I said before, there is an array of different paranormal/supernatural creatures featured in this book. Ari comes across vampires, harpies, witches, warlocks, shifters, demigods, voodoo priests and a few others that haven’t exactly been identified yet. All of these creatures take solace in New 2 – the city that arose from the aftermath of Hurricane Katrina. In this slightly futuristic story (about 15 years ahead) New Orleans has become sort of a sanctuary from the outside world. The land was purchased from the United States and became a self-sufficient area for a variety of outsiders. This setup gives the book a very distinctive feel – it is almost like a dystopian paranormal/supernatural adventure. I really don’t know how to describe it adequately; just that it is incredibly unique and extremely intriguing. Darkness Becomes Her was a phenomenal start to a new young adult series. The story is full of action, adventure, suspense and excitement. The plot is packed with surprises - different creatures and monsters greet you around every corner. Honestly, Keaton threw in everything but the kitchen sink into this incredibly debut. I am looking forward to continuing the series and seeing what becomes of Ari and her band of misfits. This sounds really interesting! I hadn't heard of it before now, but you've really sold it to me with your review. I'm pumped to read it now! Thank you for the review, l have this to read and haven't been that excited about it till now! Glad to hear the books is good. I really want to read this one! Thanks for the review! Great review - I am looking forward to reading this one. Reading Lark thinks your blog is super cute so we are sending you the Stylish Blogger award. Click here to learn how to accept and pass it on. Thanks for this review, I've been iffy on whether or not I was going to try it but after reading your review..I think I'm going to give it a go. Very much looking forward to reading this book too Sarah, thanks for the non spoilery review as I love Kelly Gay and sounds like her alter ego Kelly Keaton is going on my auto-buy list too!